Today we entered in a new consignor, and were blown away by their dropoff. LOTS of great dresses, skirts, blouses, and more. Brands like Bonpoint, Catimini, Jacadi, Little Marc Jacobs were in the mix. Both Winter AND Spring items were dropped off, so expect some great stuff come Springtime. Light-weight Spring jacket by Bonpoint. Both are size 4, $19.99 each. 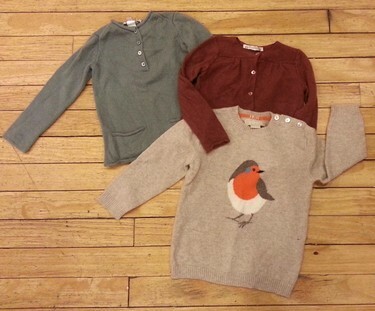 Top two sweaters by Bonpoint. Both are size 3 (rust color sweater had no size tag).